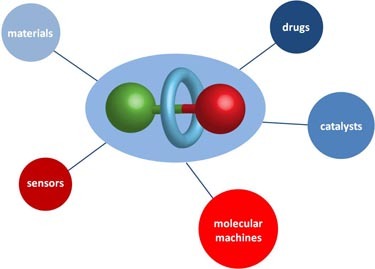 The active template approach to mechanically interlocked molecules is a versatile and powerful method for synthesising catenanes and rotaxanes which are impossible to form using other methods and the first approach capable of operating with substochiometric quantities of template. We recently pioneered the use of �small� macrocycles in active template reactions in order to allow the synthesis of �small� rotaxanes. Initial studies on the copper mediated �click� triazole active template reaction revealed that small macrocycles actually increase the yield of the desired rotaxane, a somewhat surprising result considering the level of steric congestion in the interlocked product. We demonstrated the utility of this approach through the synthesis of a number of functionalised rotaxane products in high yield. We are now applying this methodology to the synthesis of complex functional rotaxanes including insulated molecular wires for molecular electronic applications and small molecule fluorescent sensors. For more information see: Angew. Chem., Int. Ed. 2011, 50, 4151. We have recently extended our small macrocycle AT-CuAAC methodolofy to the synthesis of a sterically protected Cu(I)-organometallic which suvives column chromatography and aqueous work up. It can even be synthesised under aqueous conditions! This is only the second example of an isolated Cu-triazolide and the first to display this level of stability. This further demonstrates the potential of the mechanical bond to stabilise reactive species and we are currently investigating the properties of these extremely unusual copper complexes. For more information see: J. Am. Chem. Soc. 2013, 135, 13318. Interlocked structures such as catenanes, rotaxanes and knots can display molecular asymmetry as a direct result of the mechanical bond. However, relatively few such molecules have been isolated enantiopure because the methods needed to produce them (usually chiral stationary phase HPLC) are not suited to large scale investigations. We recently demonstrate the first scalable synthesis of mechanically planar chiral rotaxanes in high enantiopurity, using a "chiral auxiliary" type approach: the AT-CuAAC reaction using a covalently chiral stopper was used to synthesise and separate mechanical diastereomers that differ only in the orientation of the macrocycle. Subsequent cleavage of the auxiliary from the separated diastereoisomers led to mechanically chiral rotaxanes in >99% ee. We are now working to extend this approach to other active template reactions and investigate the properties of this newly accesible form of molecular asymmetry. For more information see: J. Am. Chem. Soc., 2014, 136, 4817. N-heterocyclic carbenes are versatile ligands for transition metal catalysis and as organocatalysts in their own right. We are interested in using these moieties in molecular machines which carry out chemical reactions. However, in order to do this we must clearly understand the mechanism and selectivities of the reactions we wish to employ. Our investigation of the mechanism of NHC-mediated transesterification of vinly esters reported by Nolan and Hedrick and Weymouth revealed that the accepted course of the reaction, formation of an acylimidazolium species is almost certainly incorrect and that the reaction actually proceeds via a protonated Breslow-type species as shown. In addition to having important implications for the use of this organocatalytic reaction for the synthesis and operation of molecular machines, this result affects the development of assymetric NHCs for the kinetic resolution of racemic alcohols. 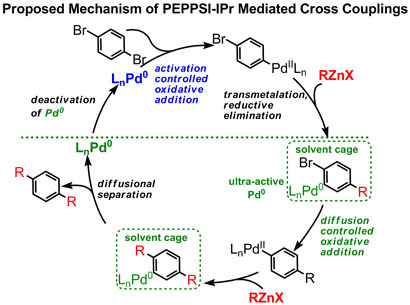 We have also carried out detailed investigations of cross coupling reactions mediated by Organ�s PEPPSI-IPr catalyst where the palladium centre is ligated by a sterically hindered NHC. These studies, in collaboration with Igor Larrosa, revealed that reactions of polyhalo aromatics mediated by PEPPSI-IPr lead to selective polyfunctionalisation. This behaviour was attributed to a diffusion controlled oxidative addition process, an extremely unusual result with profound implications for the synthesis of structured polymers and which make this catalytic species an attractive target for inclusion in synthesising molecular machines. Metal ions play a pivotal role in many biological contexts including in the onset and progress of certain disease processes. In collaboration with Mike Watkinson we carry out research on novel small molecule sensors for metal ions which could be useful in enhancing our understanding of such diseases as diabetes. In particular we are interested in detecting zinc ions selectively with subcellular resolution and in real time in vivo. We recently disclosed two sensors which show promising results in a live zebrafish model.